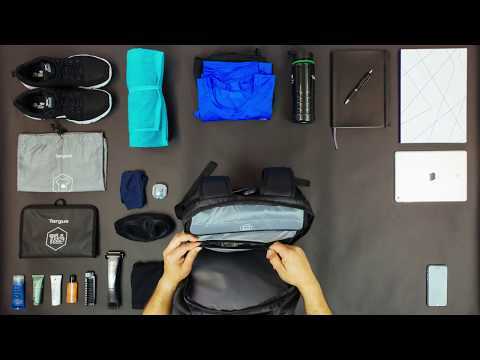 The Targus Work + Play ‘Fitness’ Backpack is ideal for commuting professionals with active lifestyles. Intelligently designed, with three dedicated compartments for your laptop (up to 15.6""), work accessories and sports gear, it’s as versatile and adaptable as you are. It’s your Work/Life balance in just one bag. Hang the Work+Play backpack on your locker and open it all the way up for easy access to all your gear. No more rummaging about to find your headphones. A place for everything and everything in its place. The Work+Play backpack comes with a separate laundry bag for your dirty gym kit and a detachable wash bag for hitting the showers. Keep your loafers or your heels clean and your trainers away from your shirts with this handy compartment for your shoes. We’ve built our reputation on keeping your tech safe. The laptop compartment is specially lined, cushioned and fastened to protect your tech from knocks and scratches.